Below we will list some examples of the various Muzzle Brakes, Tactical Compensators and Flash Hiders for the Armalite AR10, DPMS LR-308 and other .308 Pattern AR rifles. If there’s anything I missed worthy of noting feel free to drop me a message. While browsing the net I came across the AlumailteUSA line of muzzle brakes. The .308 model is pretty interesting looking. If anyone has experience with these please drop me a line. 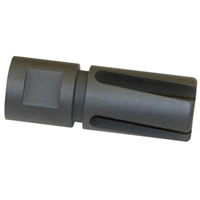 Smith Enterprise .308 VORTEX FLASH HIDER – This is the standard by which all other flash hiders are judged. Four, specially angled flutes hide nearly 100% muzzle flash, even during full-auto fire, by dissipating gas and retaining un-burned powder for increased residual burn. Constructed of the same 8620 bar stock steel used in the manufacture of AR-15/M16 bolts and carriers, then heat-treated to provide a high-strength core and tough, outer shell. Special, helix design helps align exiting barrel gas to improve accuracy with all bullet types. Streamlined unit reduces muzzle flash with four, 15° helical flutes. 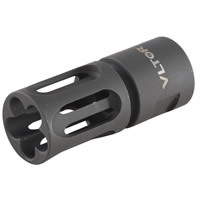 Provides Vortex technology for an AR-10. SPECS: 8620 steel. Parkerized, black, matte finish. 5⁄8″-24 tpi. 2-11⁄16″ (6.8cm) long, .905″ (2.3cm) dia. 3.9 oz. (112g) weight. Fits Rem 700 Tactical and AR-10 in .308 Win. VLTOR VC-301 – Highly-efficient internal helical design uses ten precisely contoured longitudinal ports combined with a unique, cloverleaf-shaped exit port to trap unburned powder particles long enough for full burn and dissipation of hot combustion gasses. Muzzle flash cancels itself out to minimize shooter exposure during daytime and low-light situations. Also serves as a compensator by directing venting gasses to help reduce muzzle jump and improve shooter control for better shot placement. Precision machined from 4140 steel to stand up to rough tactical operations. 2-1/8″ overall length brings a 14½” barrel up to legal length for civilian use when flash suppressor is permanently pinned or welded in place. Accepts most sound suppressors and Blank Firing Attachments designed to fit a M16/M4 flash hider. VC-1 fits .223/5.56mm AR-15/M16/M4 rifles; VC-301 fits .308/7.62mm AR-style rifles. 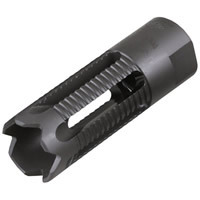 Yankee Hill Machine .308 PHANTOM 5C1 COMP/FLASH HIDER – Flat, non-serrated muzzle face helps prevent catching or snagging muzzle tip during storage or deployment. Five, longitudinal vents help hide flash while dispersing gases up and outward; tames muzzle rise and keeps your front sights on target. Outward facing ports and solid panel on bottom help eliminate dust signature when shooting in the prone position. For threaded barrels only, includes crush washer. .223 model has grooved, base rings that accept training attachments and sound suppression devices for LE and military personnel. SPECS: Steel, mil-spec phosphate coating. .223 – ½”- 28 tpi. 2¼” (5.7cm) long, 7⁄8″ (2.2cm) diameter. 2.1 oz. (60 g) wt. .308 – 5⁄8″-24 tpi. 215⁄16″ (7.5cm) long. 1″ (2.5cm) diameter. 4.5 oz. (127g) wt. Yankee Hill Machine .308 Phantom 5C2 Comp/Flash Suppressor – Five, straight, longitudinal vents hide flash while dispersing gases up and outward to tame muzzle rise. No downward facing port helps eliminate dust signature when shooting in the prone position. For threaded barrels only, includes crush washer. .223 model has grooved base rings that accept training attachments and sound suppression devices for LE and military personnel. Chisel-shaped front notches keep muzzle planted on your attacker during CQB situations. SPECS: Steel, mil-spec phosphate coating. .223 – ½”-28 tpi. 2¼” (5.7cm) long, 7⁄8″ (2.2cm) diameter. 2.1 oz. (60 g) wt. .308 – 5⁄8″-24 tpi. 2-15⁄16″ (7.5cm) long. 1″ (2.5cm) diameter. 4.5 oz. (127g) wt. Brownells .308 TACTICAL FLASH SUPPRESSOR – Low-profile, screw-on flash suppressor meets the needs of the most demanding tactical and competition shooters. Developed by Brownells’ in-house engineering team with plenty of input from the many dedicated shooters on our staff to give you a powerful flash suppressor that also helps reduce muzzle rise. Disperses combustion gases through five longitudinal vents to reduce the blinding, football-sized fireball of an unsuppressed rifle to a low-intensity golf ball sized burst. Greatly lowers the chance of muzzle flash giving away the operator’s position day or night, and helps preserve night vision. Vent walls are cut at an angle for maximum surface area to help cool gas and redirect it to counteract muzzle rise for fast follow-up shots. Solid underside prevents dust signature that can obscure the shooter’s view of the target or give away his position when shooting prone. 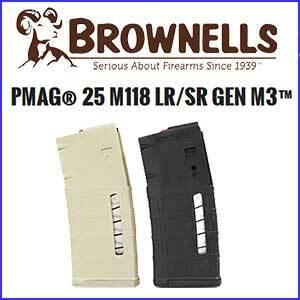 Separate models available for rifles chambered in .223/5.56mm, .308/7.62mm, and 9mm. Unique “posthole digger” muzzle has cuts that form four chisel-points to provide a backup pain compliance weapon for hand-to-hand combat without creating unusually sharp projections that snag on other objects or cause unintentional injury during routine weapon handling. Precision machined from solid 4140 carbon steel bar stock and hardened to Rc 38-42 to resist blast erosion. Long-wearing, matte black oxide finish matches many factory barrel finishes. Primary Weapons FSC30 DNTC308 – Aggressive, scallop-type cuts deliver superior gas dispersion to help stabilize the muzzle during periods of sustained fire. Special internal blast chamber with side-facing ports help reduce recoil with no adverse effect on gas system function. 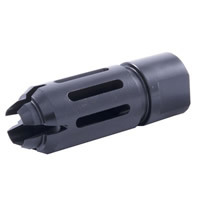 FSC556 is a .223 (5.56 NATO) compensator that also combines the full functionality of a flash hider. FSC30 provides the same muzzle-jump reduction and flash suppression as the FSC556 for rifles chambered in calibers from 6.8mm up to .308 (7.62 NATO). 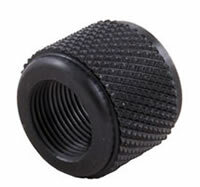 Threaded to fit muzzles with 5/8″ x 24 tpi thread, and includes a screw-on adapter that allows installation on rifles with ½” x 28 thread. DNTC308 functions only as a compensator to tame recoil on larger caliber AR-style .308 rifles. All models include washer for precise indexing of the side ports. Wrench flats directly over the internal threads help ensure easy installation. SPECS: Steel, black, matte finish. Includes washer. FSC556 – For .223 (5.56 NATO). 2-1/8″ (5.4cm) long x 7/8″ (2.2 cm) diameter. 2.2 oz. (62.4g) wt. ½”-28 tpi RH thread. FSC30 – Fits AR-style rifles in 6.8, .270, and .308. 2¾” (7cm) long x .960″ (2.4cm) diameter. 3.6 oz. (101g) weight. 5/8″-24 tpi RH thread. Includes ½” x 28 adapter. DNTC308 – For AR-Style .308. 2½” (6.4cm) long x 7/8″ diameter. 2 oz. (57g) wt. 5/8″-24 tpi RH thread. 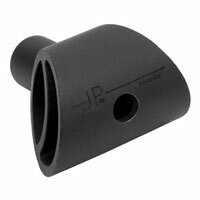 JP Enterprises .308 RECOIL ELIMINATOR – Experience quick sight recovery after every round with the outstanding performance of the JP .308 Recoil Eliminator. This amazing accessory lets greatly reduces recoil in AR-10 type rifles and is ideal for all shooting scenarios across the spectrum. It has been reviewed by professionals as nothing short of amazing. The .750 outside diameter is designed for standard military contour barrels, but can be tapered down for smaller contours. BENNY HILL “ROLLING THUNDER” COMPENSATOR – Heavy duty compensator designed by noted custom gunsmith and 3-gun competitor Benny Hill employs a unique internal expansion chamber that redirects some of the combustion gas out a topside gas port to virtually eliminate muzzle climb. The sights stay on the target, so you can make exceptionally fast follow up shots. Precision machined from a solid billet of high-grade stainless steel, with large side ports that vent more gas to help reduce felt recoil. Solid bottom prevents dust signature when shooting close to the ground. Perfect for USPSA and 3-gun competition where seconds count, and for varmint hunters who want the sight to stay the target when they take a shot. Models available for rifles chambered in .223 and .308. EGW SPACE COMP – Machined steel compensator has four equally spaced vents on each side that redirect combustion gases upward and to the sides for a significant reduction in felt recoil. Helps you keep the muzzle down and the sights on the target for faster follow-up shots and smaller groups. Solid bottom prevents kicking up ground debris when shooting prone, while solid top keeps muzzle flash and venting gas from obstructing your view of target. Models available to fit rifles chambered in .223/5.56mm, .308/7.62mm, and 9mm. Precision machined from carbon steel bar stock, with a hard, matte black Parkerized finish that resists heat, scratches, and abrasion. Legal for USPSA Limited Division competition. SPECS: Carbon steel, Parkerized, matte black finish. 2″ (5.1cm) long, .990″ (2.5cm) O.D. 3.4 oz. (96.4g) weight. .223/5.56mm – ½”-28 thread. .308/7.62mm – 5/8″-24 thread. 9mm – ½”-36 thread. Gunsmith installation recommended. 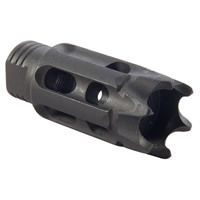 R3E2C MUZZLE BRAKE – Single, large expansion chamber with forward baffle, traps and redirects muzzle gases to greatly reduce muzzle rise and blast. Dust printing and muzzle rise are all but eliminated. Stainless steel construction for superior resistance to powder corrosion. For all calibers center hole is .030″ over bullet diameter. May be gunsmith enlarged to larger diameter. Available with .575″-40 tpi; allows installation on smaller diameter, slim-tapered barrels that require a shallow thread depth to maintain maximum bore to O.D. wall thickness. Exclusive supplier to elite U.S. military forces. .308 TALON BRAKE – Hardened steel muzzle brake vents gas up and to the sides through nine ports to counteract recoil and keep you on target even in full auto fire. Distinctive “claws” at muzzle give your rifle an aggressive appearance, but won’t cut bare skin unless intentional force is applied, making the Talon an excellent CQB backup device. Precision machined from pre-hardened chrome-moly steel, and available in-the-white, Parkerized, to match the factory finish on most barrels, or natural-finish stainless steel. Chrome-moly brake available with Parkerized finish to match the factory finish on most barrel, or with Lava Shield, an extremely hard, chemical- and corrosion-resistant ceramic coating. Primary Weapons AR 308 .308 Shim Set – Hardened steel shims ensure precise fit and correct alignment of flash suppressors, muzzle brakes, and compensators. Large (thick) shim allows 90° of rotation and can be used as a spacer for barrels not having a relief cut behind the threads. Medium shims add approximately 45° of rotation. 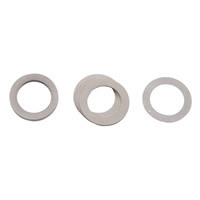 Small shims used with large and medium shims provide smaller degrees of rotation for finely-tuned, critical alignment. 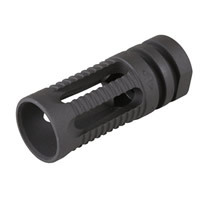 308 AR 5/8″-24 Thread Protector – Sure its not a muzzle device but it sure is handy to protect those muzzle threads for those times when your without a muzzle attachment.